Katla Building to a Major Event? They claim that all the world’s nations combined pumped nearly 38.2 billion tons of carbon dioxide into the air from the burning of fossil fuels such as coal and oil, according to new international calculations on global emissions published in the journal Nature Climate Change. That is 32 kilotons per day when one volcano Katla, which is a huge hidden volcano 650 feet beneath the ice cap in Iceland, is emitting 20 kilotons of C02 every day. There are only two volcanoes worldwide that are known to emit more CO2, and now scientists are concerned that Katla may be headed toward a major eruption. Obviously, the UN should be imposing a tax on Iceland for all this added Co2. Katla has had about 20 eruptions in the last 1100 years. There were eruptions which have been documented in the years 920 and 1612, and from 1821 to 1823. These latter eruptions in the 19th century helped to cool the planet contributing to the mini ice age at that time. 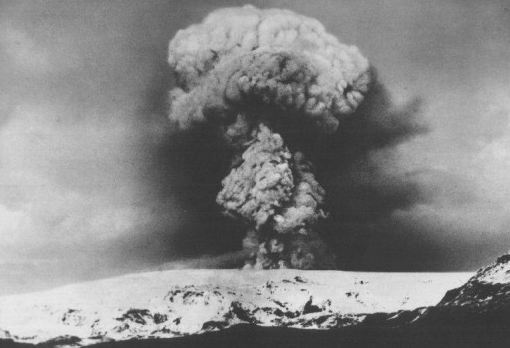 The last eruption that actually broke through the ice cap occurred in 1918. There have been subglacial flood events in 1955, 1999 and 2010-2011 that melted ice but it did not break the surface. These events do create flooding as the ice melts. Volcanic activity produced two eruptions in 2010 at Eyjafjallajokull, on March 20 and April 14. The second eruption created the giant ash cloud over Europe which diverted air traffic. The 1918 ash plume was documented to have reached heights of 14 km. That event looked like a mushroom cloud from an atomic bomb. It is hard to draw a conclusive model since the majority of eruptions only melt ice beneath the surface. The best we can do with an approximation for the events that break through the surface puts it in 2020-2021 for the next ideal event. But the data series is not definitive on this event. It does appear that Katla has become active again since 2010 and is building to a climax. This could also be an event that contributes to global cooling as we saw during the 19th century.